← Is Flossing Really Necessary for Good Oral Hygiene? Why are Invisalign® Braces so Popular? The difference is literally night and day. The answer is simple: because they work and are invisible (for the most part)! The main benefit of Invisalign braces are the simple fact that they are indeed clear braces; making them harder to be seen by your peers. This happens to be one of the main selling points, too. It’s even implied by the name “Invisalign” – or invisible aligners. Absolutely not! Believe it or not, more and more adults are flocking to their nearest orthodontist because they want to improve their smile. They’re tired of not being completely satisfied with the way they appear to the outside world. Let’s face it: the way we look and perceive ourselves drastically affects our self-esteem. 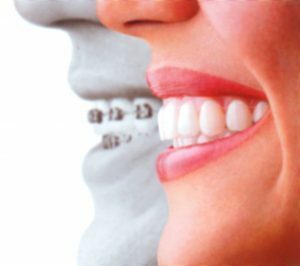 An adult having braces is becoming a lot more commonplace and with the option for clear, removable braces such as Invisalign – it becomes that much easier to straighten our teeth without enduring a year or two with odd-looking wires and brackets. Social Media Plays a Role? Speculation points to social media being a huge factor in driving people to seek ways they could improve their appearance: plastic surgery, cosmetic dentistry, gym memberships, etc. We want to be able to impress our friends, families, peers, and future employers. Being presentable in our society today has never been so important. Is this a bad thing? That’s up for you to decide – but we like to believe seeking to enhance our lives is never a bad thing! This entry was posted in Doctor2th, Irvine Dentist and tagged clear braces, Invisalign Irvine, Irvine Cosmetic Dentistry, social media self esteem, types of braces. Bookmark the permalink.